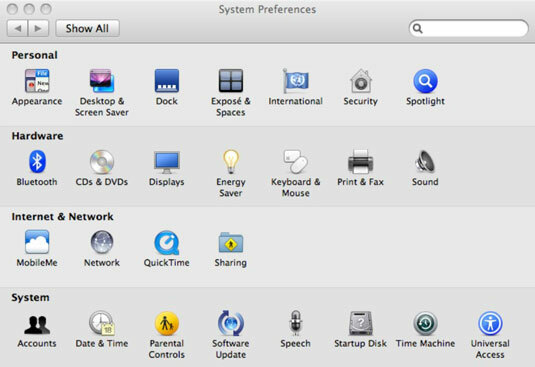 In Systems Preferences, you can do a lot of customizing of your Mac. You can change the date and time, alter sound and displays, and update software. Date and time: You established the date, time, and time zone when you set up the Mac initially. In System Preferences, you can move the location of the clock from the menu bar to a separate window. You can change the appearance of the clock from a digital readout to an analog face with hands. You can display the time with seconds or use a 24-hour clock. You can even have the Mac announce the time on the hour, the half hour, or the quarter hour. Displays: Resolution is a measure of sharpness and is expressed by tiny picture elements, or pixels. You will see resolution written out as 800 x 600, 1024 x 768, 1680 x 1050, and so on. The first number refers to the number of pixels horizontally, and the second number is the number of pixels vertically. Higher numbers reflect higher resolution, meaning the picture is sharper and you can fit more on the screen. At lower resolutions the images may be larger but fuzzier, though this depends on your monitor, and any resolution other than the native one on an LCD display will be somewhat fuzzy. Lower resolutions also refresh, or update, more quickly, though you will be hard-pressed to tell with most modern monitors. As it happens, the refresh rate doesn’t mean boo on computers such as iMacs with LCD or flat-panel displays. You can also play around with the number of colors that a Mac displays (millions, thousands, or down to a puny 256). Best advice: Play around with these settings if you must. More often than not, leave well enough alone. Sound: Check out other sound effects in System Preferences. You’ll hear one whenever the Mac wants to issue an alert. Sound preferences is also the place to adjust speaker balance, microphone settings, and anything else having to do with what you’ll hear on the Mac. Software update: From time to time, Apple will issue new releases of certain programs to add new features it won’t make you pay for, to patch or fix bugs, or to thwart security threats. For a full log, click Installed Updates. You can have the Mac check for automatic software updates daily (might be overkill), weekly, or monthly, or on the spot. If you choose, the Mac will fetch important updates in the background, and bother you only when the program update is ready to be installed. Software Update is accessible also directly from the Apple key’s menu.